May is National Healthy Vision Month! I didn't know that this month was National Healthy Vision Month until today. It is one of those strange coincidences. I was going to write about eyes today. This had me shaking my head. While it may be fine for some people, this is a terrible idea for people with diabetes. Okay, I think it is a bad idea for everyone. When you have your eyes checked, the doctor is looking at more than whether or not you need glasses and if you wear glasses, if they need to be changed. 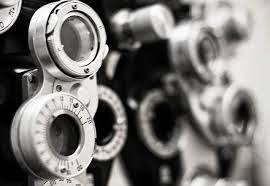 I interviewed an eye doctor for this blog before in the post entitled "Interview with a Optometrist. "The eye doctor is checking much so much more than just doing a refraction (the test to check for glasses.) When you are diabetic, there are several things that can affect your eyes and if you do not have your eyes checked regularly, you could be in danger of losing your eyesight. I understand the concept of not wanting to go to the doctor. I even understand that the eye doctor can take time because you have to wait while your eyes are dilated. But you need to go and have that done. Diabetic retinopathy can sneak up on you. The damage can move slowly and then by the time you realize it, damage has been done it is irreversible. So, please ignore the concept of "eye exams online" and go see your eye doctor. They are really part of your team.